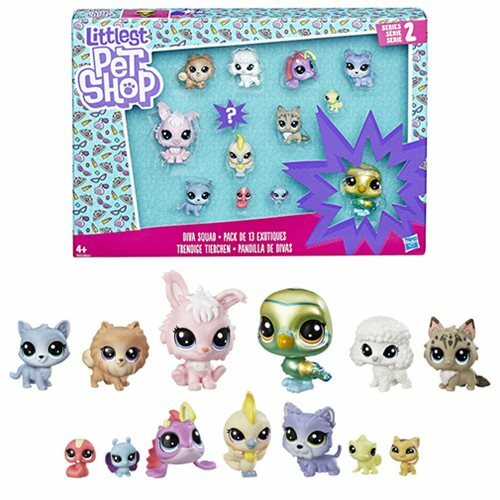 Shopping for Littlest Pet Shop Mini-Figures? Here's an instant collection, with 13 pets in one pack! Featuring Edie Von Keet and 12 of her dearest friends, these pets come in all three scales: Classic, Mini, and Teensie. This fun selection (dogs, a monkey, a snail, and more) includes pets with an attitude all their own! It's is a wonderful start – or addition – to any Littlest Pet Shop collection! Includes 2 Classic-, 7 Mini-, and 4 Teensie-scale pets. Ages 4 and up.